I found a few videos of people spinning in Nepal. First off is a woman spinning suspended on a bottom whorl spindle. I think there is a notch at the top of the shaft. She spins wool from a ball of what I think is pre-drafted roving. She pulls out a length first and butterflies it on her spinning hand and starts the spindle between the palm of her hands. In the second video two women are spinning on similar spindles with the same technique and the balls of roving attached to their belts. They also lead the thread over the top of their heads. As a bonus, the third woman is carrying her child in a sling on her back, something that brings back sweet memories from when we carried our youngest in all sorts of slings. In the third video, a man is spinning on a spindle that looks the same as in the first two videos. He has arranged his roving (yak?) around his wrist and spins in-hand style. Eventhough all the spinners are standing, the videos show spinning arranged for mobility. The tools and techniques are adapted to a moving life. Staying in the same place doesn’t seem to be relevant. In a fourth video, a man is spinning nettle with an in-hand spinning style. The spindle looks completely different from the three above. The strick of hemp is arranged somehow, either on a distaff or over the spinner’s shoulder, it is hard to tell from the video. I have finished another spinning video! This time I haven’t done the filming myself, so the quality is much better. My husband was behind the camera, which means I had a great photographer and a great camera. And my fourteen year old made the sweet yarnimations. Locations are at home in Stockholm, in the Sazkammergut area in Austria and in Tiveden, Sweden, which are all my favourite places. I had an idea of a spinning video with just beautiful spinning in beautiful scenery, to illustrate sort of a poem, an ode to spinning. So, during the summer we scouted locations wherever we went, and tripod, camera and spindle was set up where the spot was spot on. I saved all the clips for winter, so that I could make a beautiful spinning video at a time when I would miss light and summer the most. I got the music from the Free music archive. Spinning tools from Malcolm Fielding, Kromski, Jenkins yarn tools, Roosterick and Neal Brand. Usually I take the bike to work. But occasionally I have to leave the bike at home and take the subway. I don’t like it at all, but I always bring some wooly friend to ease the pain. Today I went to work un-biked and my sweet Jenkins Lark kept me company. Fluff is from Vinterverkstan. My biggest film project – so far – is Slow fashion. It began as an idea of showing the whole process from sheep to sweater. As it happened, I did have a clip from when I was shearing a sheep at a course in small-scale sheep husbandry at Överjärva gård, so I was able to start the project even earlier in the process than I had originally planned. And when I saw Valérie Miller’s Fileuse pattern I just knew it was the right pattern for the project. The perfect pattern for the project. The white fleece is from the finewool sheep Pia-Lotta at Överjärva. Hers was actually the very first fleece I bought when I started learning how to spin and I was so happy to learn that I was going to shear her. Pia-Lotta was so calm when I shore her. The sheep just stood there while I was leaning my legs against her. She did pee a lot, and she was actually standing on my foot once while peeing, but it was still definitely worth it. Shearing the finewool sheep Pia-Lotta. There was a minor setback in the production in the spring when I was waiting to get my hands on the second fleece, a grey fleece from a Jämtland sheep from Vemdalsfjällens alpackor. The sheep Gråan was their only grey sheep and I was very thankful to be able to buy so much of it. But the weather was really wet up there in shearing season, so the owner couldn’t shear the sheep for weeks. That is slow fashion, literally. The two fleeces are quite different. 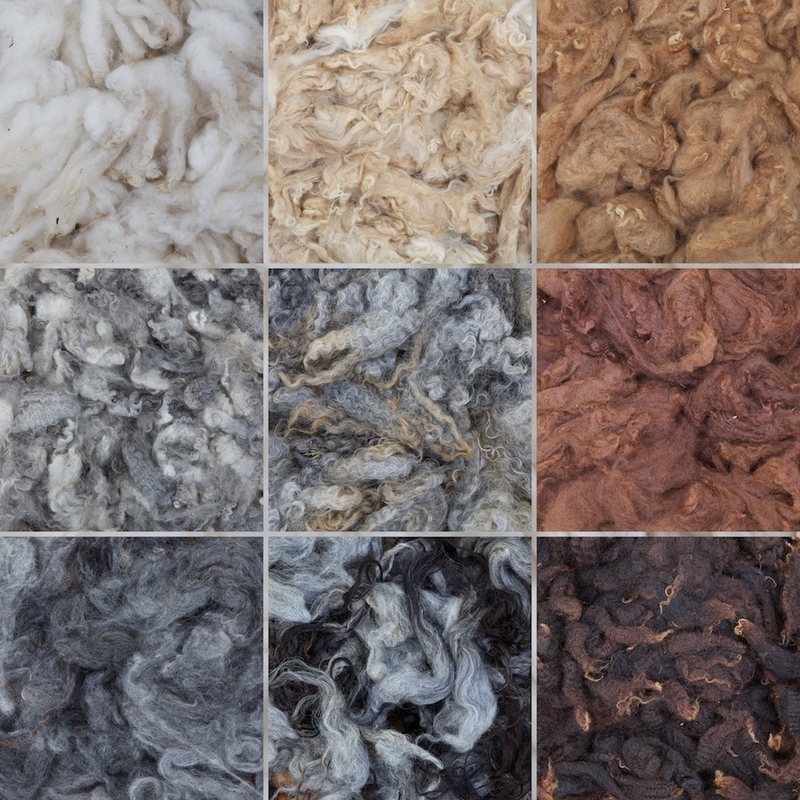 The finewool fleece is springy and fluffy and perfect for carding and long draw spinning. The Jämtland fleece has a really long staple of very fine fibers and ideal for combing and short forward draft. The Jämtland sheep is a quite new Swedish breed, bred to be a domestic alternative to merino wool shipped from the other end of the world. The shearing part was shot in a simple sheep shed, but the all the rest of the clips were filmed outdoors. There are so many possibilities when filming outside, and there’s no clutter to consider. Most of the shots were filmed around our home in Stockholm and at Åsebol sheep farm. Some shots are from Austria and the very last piece is from Bressay, Shetland at Shetland wool week. I shot the sheep parts and my family and a few friends patiently filmed all the parts with me in front of the camera, which were quite many. My brother-in-law arranged and played the beautiful piano piece. One of the hardest parts of filming was the sheep shots at Åsebol. I wanted some closeups and preferably some cuddling shots. But the sheep were not interested at all, as soon as we, very gently, got into the pasture, they went in the other direction. On our last day we cheated and brought the owner with some sheep goodies and they came running and I could eventually leave happy. I wrote in the beginning of this post that the project began as an idea of showing the whole process. But it ended up being so much more than that. It is a celebration of sustainability, serenity, the slow fashion movement, and, perhaps most of all, the love of spinning.